This continues my series (see June 1 and June 5) about the background of the imminent new English translation of the Mass. This blog, moreover, has shown that the essential problem about both the 1970s translation, and the second (abortive) version which was finished in the early 1990s, was that each embodied a policy of rupture: it was designed to cut off the worshipping community of its own day from the memory and continuities of Tradition - that is to say, from the the old Testament and New Testament echoes in the Latin prayers; from the actual meaning of the Latin; from the great paradosis of worship which has been evolving, generation by generation, for nearly two millennia. It is no exaggeration to say that, since about 1970, English-speaking Catholics have been deprived of the authentic worship of the Roman Catholic Church by having 'translations' used in their churches which express only a minuscule amount of the content of the Latin originals. And I am not talking about the elimination of the 'Tridentine' liturgy. It is the post-conciliar Missal - the Latin Missal of Pope Paul VI - that people have been prevented (by bad translations) from being able to appropriate and to internalise in their Christian consciousness. It is worth emphasising this, because some interests, with a slipshod grasp upon history as well as upon rhetoric, have been suggesting that the new translation which we shall begin to use in September represents some sort of retreat from the agenda of Vatican II. In fact, it does exactly the opposite. September's new translation means Onward To Vatican II. Quite apart from the different questions surrounding the elimination of the Tridentine Rite, it is the post-conciliar Missal, the Missal authorised by Pope Paul VI "by the mandate of the Second Ecumenical Vatican Council", that was kept hidden, by faulty translation, from the ears of the faithful for four decades. It is, substantially, the Missal of Paul VI that the new translation will now begin to make accessible to the People of God. Enthusiasts for Vatican II, and its aftermath, and for Paul VI, should be applauding the new translation. It provides what they claim they want. Remember: the Council never said that the Mass had to be in English; it simply authorised some degree of vernacular use. This guarded permission was subsequently extended, not by the Council but by a series of unilateral decrees emanating from the Curia. And the Council certainly did not decree that vernacular translations should be such as to obscure a large amount of the meaning of the authorised Latin texts. The Instruction which bears responsibility for the currently expiring translation, Comme le prevoit, had nothing to do with the Council. Again, its origin was in the Curia. People who claim to have a suspicion of the Curia and of its 'dominant role in the Church's life', should, if they have any consistency or logic, be prejudiced against the 1970s translation of the Mass. The new translation, which our bishops, laudably, are bringing in earlier than most other hierarchies, means: back to Paul VI; back to the Missal which derived from the Conciliar impetus. Those fighting a rear-guard action against it should sort out their own confusions. Next time, I shall write about the Roman Instruction Liturgiam authenticam, which is the methodological basis of the translation due to come on stream in September. Intellectually, academically, the most exciting thing about Summorum Pontificum and Universae Ecclesiae is that they establish a level playing field in discussion about the relative merits of any conflicting provisions in the OF and the EF. Perhaps this is one of the things the Holy Father had in mind when he spoke about mutual enrichment. Previously, as enactment after enactment emerged from the Consilium ad exsequendam Constitutionem de sacra Liturgia and its successor bodies, it was plausible to hold that these represented the Magisterium of the Church. Here was the Holy See making liturgical enactments by mandate of an Ecumenical Council: what more could anyone want in terms of authoritative teaching about the meaning of the Church's rites? If one dissented, was one not dissenting from the direction in which the Holy Spirit was leading the whole (Roman Rite) Church? Surely, one was dissenting from the mind of the Holy Father, from the Bishop of Rome who, surely had to be the normative authority about the rite of his own Church? Dissent from the old rite had now - surely - become privileged; dissent from the new rite had become inherently dubious, a sign of disloyalty. At a stroke, SP/UE changed all this. We now had two forms of the Roman Rite "one alongside the other" (qui ad invicem iuxta ponuntur). Thereby we were authoritatively given, in areas where the two rites and their accompanying liturgical cultures happen to be at odds, what I would like to call Symmetry of Dissent. It is now no more 'disloyal' or 'contrary to the mind of the Church' to evaluate critically the OF and its culture than it is to criticise the EF and its culture. Such critical evaluation, it goes without saying, ought to be done - in each case - with a humble recognition of one's own fallibility, and with a charitable instinct not to hurt fellow Christians whose faith in the living Lord is fed from different sources than those which nourish one's own. It is right that those who enthusiastically favour the EF, and who feel a certain triumphalist joy about Pope Benedict's liturgical legislation, should if necessary be reminded of this. However, I do not always sense - least of all in the periodical called the Tablet - an awareness that those, too, whose orientation differs from the OF, have a right to be treated with a similarly charitable exercise of the acceptance of diversity. It was in the spirit of the Principle of Symmetry of Dissent that I ventured recently to evaluate critically the post-conciliar valde optatum that communion be given from Hosts consecrated at the same Mass. I called it 'dated', because it seemed to me to have all the marks of the (to me, as to Pope Benedict, questionable) liturgical culture of the enclosed circle - the celebrant facing the people; the location of the entire liturgical event as situated in the middle of a closed group. This culture is 'dated'; it is of the 1970s. And there are things about the Mass of S Pius V which I would have to admit are dated: for example, the assumption in its rubrics that Mass normatively does not include a Communion of the People - yes! look at the rubrics! It is not even mentioned in passing as an occasional possibility! 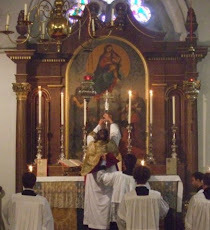 Yet I have never witnessed a modern Old Rite Mass in which there were not communicants ... usually an awful lot of them. That lacuna in the rubrics ... and the cultural assumptions it implies ... is dated; and I doubt if anyone would deny it. Have another look at that half-hour video of the Econe Consecrations! ... on Tuesday, our Lady Auxilium Christianorum, commemorating the return of the Holy Father from Napoleonic Captivity. Does anybody know anything about the Brandimarte who, according to the Google links, wrote the delightfully, exuberantly, Baroque Office Hymns for this feast? The Sapphic metre does fit this sort of thing rather well, doesn't it? Does anyone know why the Feast was in the old Calendar for England, but disappeared (except in Wales) when this was replaced by separate propers for the English RC dioceses? Then Gregory VII, Papa Hildebrande. I remind the Patrimony that Dom Gregory Dix claimed that he had taken the name Gregory in religion, not as an allusion to S Gregory the Great, but as a tribute to Hildebrand "who deposed more bishops than anybody else in history". Then S Philip Neri, who has done so much for English Catholicism. Can anyone explain to me why it is that when we are venerating his (or other) relics, the priest taps our head with the reliquary if we are male but not if we are female? Is it anything to do with the Paulinum about Headship? paras 1,2,3,4: Notice how, in accordance with this same stylistic trope of variatio, the Pope is referred to differently as Summus Pontifex, Sanctitas Sua, Apostolicus Dominus. This last of these seems to me to have an early first-millennium flavour to it; I have traced the language of it back to a letter from the Emperor Maximus to Pope Siricius (384-399); and there is a whiff here of the Ordines Romani (except that later in the first millennium dominus would have been syncopated to domnus). A tiny verbal harbinger of a more First Millennium Papacy? para 5 heic How delightful to see this unusual orthographical rendering of hic! OLD says that it is common in inscriptions. Does this mean that the official responsible spends most of his spare time with his nose in the Corpus Inscriptionum Latinarum? Let us hope that he is not too addicted to all those naughty graffiti in Pompei! para 10(2) emanat seems to have acquired a transitive sense in the corridors of modern Rome. para 20(c) Slightly odd. It seems to imply that if only a malevolent bishop could prevent a priest from ever saying a first EF Mass, that priest would never attain to full idoneitas. para 21 enixe is missing from the English version. In the Latin, ordinaries are strenuusly asked to ensure the appropriate formation of clergy. But we English are so laid back that the Vatican dare not strenuously ask Anglophone bishops to ensure this provision. para 21 providebitur. The English reads ... seminaries, where future priests should be given proper formation, including study of Latin and where pastoral needs suggest it, the opportunity to learn the EF ... The Latin says ... seminaries, in which it will be provided that future priests are given proper formation, by learning Latin and, where needs suggest it, the EF itself. I think that the Latin indicative future providebitur means "we assume they will be taught Latin because Canon Law explicitly requires that anyway ... but whether they are taught the EF too depends on circumstances." There seems to be an implication here that seminary principals may have in the past been negligent in obeying CIC 249 (on the teaching of Latin), not to mention the explicit mandate of Vatican II (Sacrosanctum concilium 36; and see Optatam totius 13). Surely not! para 24 I presume this means that SSPX priests will have to buy birettas. And I think it means that when the Oxford Oratorians sing 1962 Sunday Vespers on Septuagesima, they will have to do it in purple ... and that they will have to keep Christ the King in October, Ascension and Corpus Christi on Thursdays, et sim..
para 25 aliquae So it appears that not all the new OF Prefaces will enter the EF wholesale. The addition of just a few will be in line with the gradual tendency to add individual prefaces, which was established in the first half of the twentieth century. para 32 et quidem integre et Latino sermone. Vernacular translations appear to take this as meaning that the Breviary office must, if the 1962 Breviary is used, be said in its entirety from that rite ... i.e., if you don't say it all, you can't say any. This would make it illegal for Oratorians to sing Sunday Vespers according to 1962 unless they were all in the habit of saying their entire office according to 1962 .... Prime and all. But Laudis canticum of 1970 established a precedent by envisaging permitting decayed clergy sive ex toto sive ex parte retinere the old Breviary. I would take the Latin of UE to mean "and what is more*, they have the facultas [if they desire to use it] of reciting it in its entirety and in Latin". I feel uneasy about the suggestion that UA would have been better or stronger if it had embraced the Ambrosian, and other, Latin rites. Subject always to correction, my view is that this would have been improper and an improper exercise of papal authority. The Bishop of Rome necessarily and logically determines what the Roman Rite is. The Bishop of Milan, Successor of S Ambrose, determines what the Ambrosian Rite is. The Dominican and other such usages are, to use Adrian Fortescue's felicitous term, 'dialects' of the Roman Rite (and the usages of the Anglican Ordinariates will themselves have the same status). As such, they come within the natural liturgical ambit of the Bishop of Rome*. Rites such as that of Milan, in my view, do not (unless they contained flaws which might damage the Communio of the Universal Church; in which case, of course, the duty of the Roman Pontiff to strengthen the fellowship of his brethren would come into play). In my piece of April 28, 4th in my Ratzinger-and-liturgical-law series, I dealt with Cardinal Ratzinger's thought about the Papacy and its limitations. My concern was to demonstrate that he had a nuanced and sophisticated view of papal authority and its limits. He is concerned to emphasise that the Pope is not some sort of omnipotent despot but a person who works within limits which are inscribed in the life and in the very nature of the Church Militant. Cardinal Ratzinger made clear his view that the immediate post-conciliar period was profoundly in error in its view that a pope (especially if claiming the mandate of an ecumenical council) can do anything. In my view, he was absolutely right. It is a strange age we live in: both those on the 'left' ("The pope should allow the Ordination of Women") and the 'right' ("The pope should interfere in the details of the rites of other churches") seem to be united in holding a crude and maximalising view of the papacy which neither Papa Ratzinger nor I could easily swallow. I am neither on the 'left' nor on the 'right' ... nec dextera nec sinistra sed ubi Petrus. I wonder why it is that I sometimes feel that I am part of a despised and ridiculed minority ... even a persecuted minority. *Para 34 makes clear that the Rites of the religious orders may be used by their members. It is unfortunate that the English "translation" fails to translate the words sodalibus ... licet ... .The same principle of subsidiarity according to which individual secular clergy have the right of using the EF without needing any hierarchical approval is also enjoyed by each individual religious. If you want to engage seriously with today's point, you would be well advised to reread what I wrote, just before Universae Ecclesiae came out (honest, nobody broke the embargo by sending me an early copy; nobody ever does; I just have to rely upon my telepathic understanding of the Holy Father's mind), on April 27, the third piece of my Ratzinger-and-liturgical -law series. I was concerned to distinguish between the gradual changes made over the centuries in the Missal of S Pius V, and the radical, ruptured, novelty of the Paul VI Missal. UE para 4 makes my point with delightful succinctness. It records that the old Missal "prolabentibus saeculis incrementa novisse". That's (almost) exactly right. The old rite had additions made to it; new propers, new votives, new prefaces. Fathers: if somebody gave you a copy of the first printed Roman Missal of 1474, you'd have very little trouble using it ... just three or four handwritten changes needed in the Ordo Missae ... as long as you were prepared to glue new feasts and Prefaces in. Additions constituted overwhelmingly the evolutionary development of the rite. [The English crib inaccurately and most deplorably translates incrementa novisse as "was kept up to date".] Then UA goes on to contrast this with its description of the post-Conciliar Missal as novum. And para 25 makes clear that the evolutionary development per incrementa of the EF will continue "quam primum". ... has again written a fine piece, this time about the Toowoomba business. With a sound ecclesiological instinct based upon the ancient traditional praxis of both East and West, Father points out that the first steps in dealing with an heretical bishop should be taken by his corporate Presbyterium; if that fails, by his comprovinciales. Only on the rarest occasions, when this has all manifestly failed, should the Bishop of Rome have to intervene. We sometimes hear bloated rhetoric about the evils of Roman 'centralisation' and the sweetness of Local Autonomy. This will all ring very much more true when all dioceses, and provinces, are more ready to deal effectively with their own heterodoxies and heteropraxies. It is well known that, when he was Prefect of the CDF, Cardinal Ratzinger became increasingly irritated by local establishments who kicked all doctrinal problems into the long grass of the collis Vaticanus so that that they could then play Mr Niceguy with their own cherished local heretics: "I'm your friend, but Rome is putting pressure on me". Exactly. And something similar is true when the situation is so bad that a Roman Pontiff has to issue detailed legislation to foster licit liturgical communities of a traditional nature, and to protect them. It is splendid that there is an organ, the papacy, which can protect the small people from the bully-boys ... we who have been formed by Anglicanism know that only too well. But it shouldn't be necessary. Immediately UE emerged, I went via a link on Fr Zed's blog to the Latin text and printed it off. As one does, I instantly noticed that the last sentence of paragraph 15 in the Latin text is missing in the English version. It occurred to me today to see whether the other translations omit it ... so I went to the Vatican website and discovered that they did. While I was there, I had another look at the Latin version ... and discovered that the sentence in question was missing there!!! Here is my hypothesis. Fr Zed provided a link on his blog to a copy of UE which, in breach of the embargo, had been sent to him a little while before. In the interval between Fr Zed getting that version from his leaky chum, and the official publication, a last-minute change was made in the text. The sentence concerned: Ad numerum fidelium huius coetus designandum, pastoralis succurrit ratio, cautis tamen circumstantiis aequa lance ponderandis. Is all this evidence that, right up to the last moment, there was still nervousness about the question of how many people it takes to make up a coetus? I like paragraph 19, ordering the pro-EF Faithful not to "help or give their name to" bodies which impugn the validity or legitimacy of the OF, or are hostile to the Roman Pontiff. This does not, of course, in any way refer to bodies which, while deeming the OF to be both unquestionably valid and canonically legitimate, consider it to be an inferior form of the one Roman Rite. The Ecclesia Dei Commission does not, unfortunately, have any direct jurisdiction over the whole body of the Faithful, otherwise it might usefully have required that those Faithful who strongly prefer the OF should not question the legitimacy of the EF (did I read somewhere that the Tablet's Rome correspondent does question the lawfulness of Summorum Pontificum?) and should not be hostile to the Roman Pontiff. That would provide what we English call a level playing field. Other jolly old English phrases refer to cats and pigeons, and sauce for ganders. But perhaps I'm wrong; perhaps Ecclesia Dei does have a broader jurisdiction. Para' 8a says that the purpose of Summorum Pontificum is "Liturgiam Romanam in Antiquiori Usu, prout pretiosum thesaurum servandum, omnibus largire fidelibus". Omnibus is not qualified by a clause such as "those who want the EF"; omnibus is just omnibus. The English crib is clearly a bit worried by this, because it translates largire as "offer" ... rather in the manner of the wretched waiter who sidles up to you just when you're leaning over the table to share a conjugal confidence with your wife and "offers" you the pepper: "offer" so often means "take it or leave it but it's here if you want it". But largiri [here we draw a veil over the IV Form error of the Roman official who forgot that largior is a deponent verb] means to give bountifully ...to lavish. This document makes clear that the EF is to be lavished upon, not a minority with a preference for it, but "all" the Faithful. Isn't that rather thought-provoking? Am I right or am I right? Come to think of it, the very first sentence of UA talks about making the riches of the Roman Liturgy "propiores" to the Universal Church.